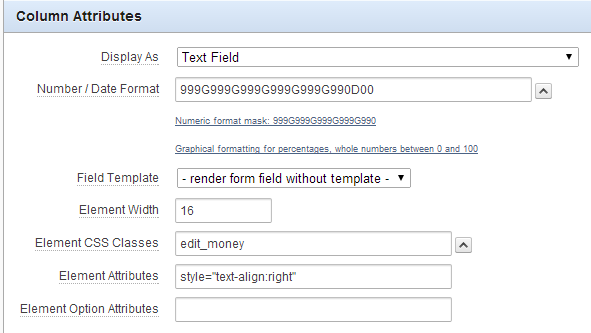 If you’re building a “finance-ey” application you probably have plenty of fields that should show and accept monetary amounts – and quite possibly these items may be implemented in a variety of ways – ordinary apex number items, edit fields in tabular reports, or even dynamically generated items using APEX_ITEM.text. In my case I had all three, scattered throughout the application. Our users routinely deal with multi-million dollar amounts and they had trouble checking the amounts visually, especially when there are a lot of zeros, e.g. “10000010.00” – so they asked for them all to be formatted with commas, e.g. “10,000,010.00”. So in my first release of the apex application I applied the “FM999G999G999G999G990D00” format to all the money amount items, including in reports etc. The users were reasonably happy with this, but thought it wasn’t working in all cases – e.g. they’d type in a new amount, and the item wouldn’t get formatted until after they Saved the record. This is because the format is only applied when the APEX rendering engine is formatting the page for display – it doesn’t apply it dynamically as the items are changed. So I started adding dynamic actions to all the apex items which would call the database to format the amount every time the item was changed. This was ok, but performance wasn’t that great – there was a visible sub-second delay while the page did an ajax call to the database just to do the formatting. ,sign      = n < 0 ? "-" : ""
,i         = parseInt(n = Math.abs(+n || 0).toFixed(decPlaces)) + ""
That worked really well, there was no visible delay, and the users were pleased. But I wasn’t satisfied – this trick doesn’t work on the tabular reports or on my APEX_ITEM-generated items. Step 4. jQuery to the rescue! All I have to do is add the “edit_money” class to all my money items. 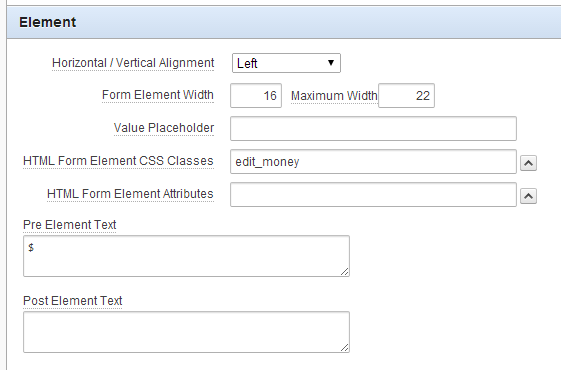 For ordinary Apex items, you put the class in the HTML Form Element CSS Classes attribute. For items in a tabular report, the same attribute is under Column Attributes, called Element CSS Classes. For items generated using APEX_ITEM, I just had to add some extra parameters (p_attributes and p_item_id), e.g.